The 2019 Grand Départ is an opportunity to celebrate the hospitality, culture, and culinary heritage of Brussels and Belgium, as well as to highlight the achievements of the many legendary athletes that have played key roles in the history of cycling. Le Grand Depart has a long history in the Belgian capital: participants in the Grand Boucle have ridden through the streets of Belgium 47 times, first visiting the capital city in 1947. 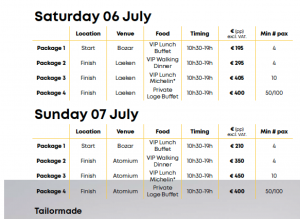 All Packages start at 10h30 and finishes at 19h. For all the details of the packages and location details, ask us the detailed Vippackages file.